Today was one of the most spectacular days of my life. We left Maun on the bus early in the morning for Gweta, a 200km journey. 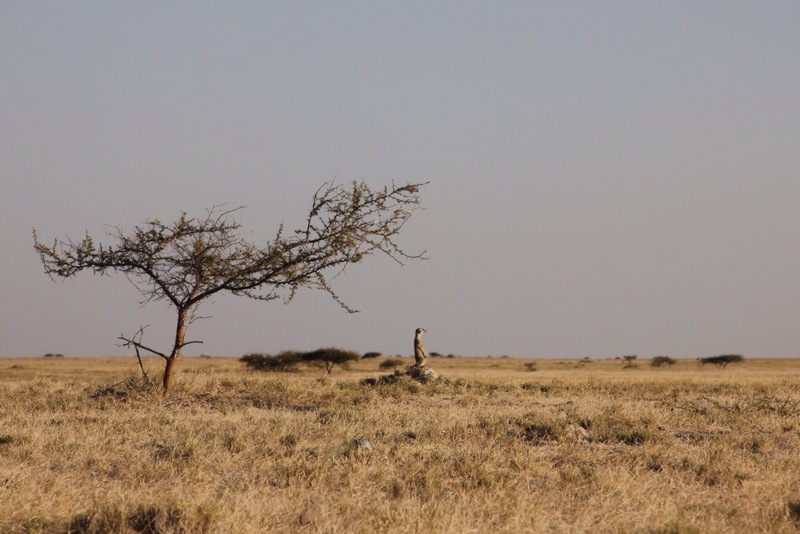 Gweta was the place we stopped just a few days ago hoping to go and visit the meerkats out in the Mkgadigadi Salt Pans. When the excursion didn’t work out the first time, we decided to just reschedule it for our return journey. Today is the return journey and this afternoon will be the start of our meerkat adventure in the Salt Pans. We arrived at Planet Baobab around 11am and had roughly 3 hours to relax before our tour started at 2pm. Planet baobab is a very interesting place, it resembles an old western saloon in the Northwest United States. There were cowhide chairs and beer bottle chandeliers. I guess Southern Africa is not that much different than the great Northwest. Cornelia gave Andrew and I loads of fruit from her parent’s garden in Maun before we left so we had plenty of delicious snacks to keep us going until the late afternoon. Around 2:00pm our guide came to pick us up and we were off to the salt pans, sitting in a huge safari vehicle with paper bag lunches in hand. We drove into the salt pans for nearly 2 hours before we reached the home of the meerkats. 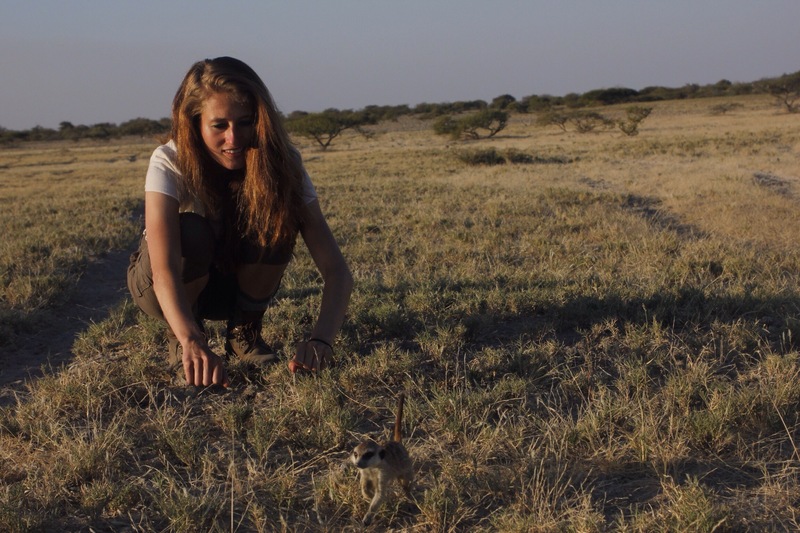 From inside our safari truck I could see the little meerkats scrambling in and out of their underground dens. My mind immediately turned to the Timon in the Lion King Movie and I could not believe that what I was seeing was real. 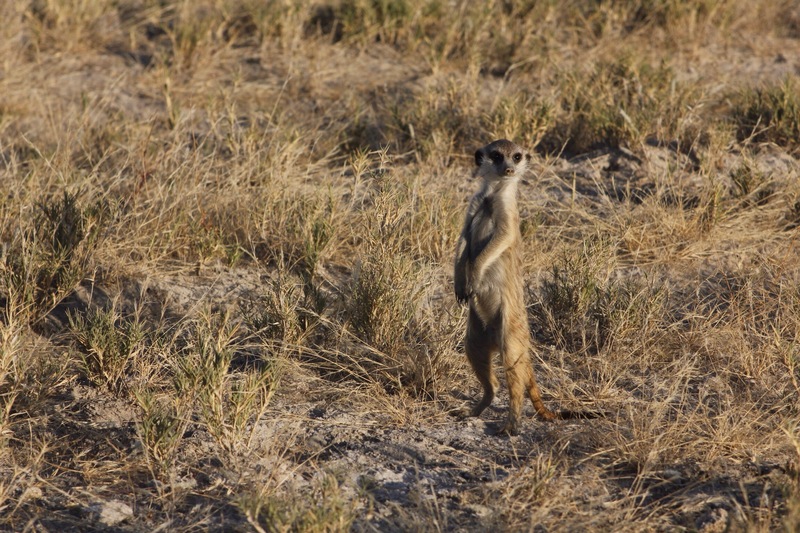 We got out of the safari vehicle, I gave Andrew my camera and began my quest habituating the wild meerkats. Like I mentioned before, I love wild animal encounters. This love was probably fostered from my desire to be a veterinarian and Zoo keeper when I was a young girl. 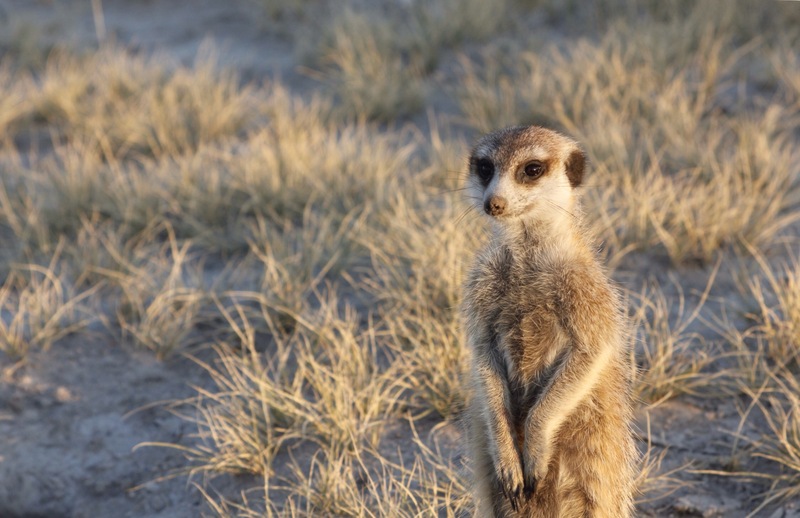 I sat and lad next to the meerkats and observed how they dig up worms from the ground for their babies and raise up on their hind legs when they observe a predator coming towards them (usually birds). I also observed how they dig their underground dens with entrances all throughout the savannah. Meerkats are very curious creatures and they would come close to me, stroking their fun against my arm. 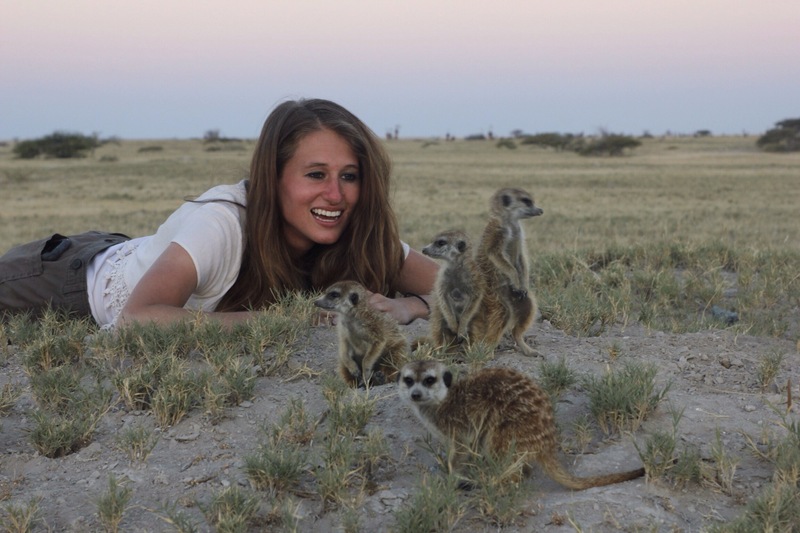 At one point three of the baby meerkats even let me pet their backs, and one actually attempted to climb on my head but it slipped on my hair. Just before the sun went down the meerkat family of eight that we were playing with decided to retreat back into their dens for the evening. It was a beautiful sight seeing them scurry into the distance with the beautiful Africa sun in front of them. Our journey continued on into the salt pans (the largest salt pans outside of those located in Bolivia). The specific pan we visited was 6,000 square kilometers and it was one of the smaller pans. 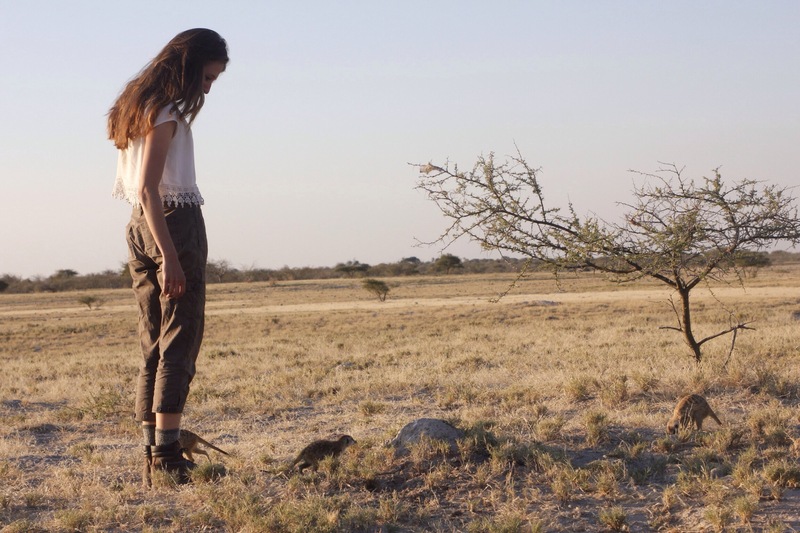 The pans used to be home to large lakes that have since dried up with the formation of the Kalahari desert. The only people that live in this part of Botswana are the San people or the bushman the migrated North from South Africa. Today their are San bushman in Zimbabwe, Botswana, and South Africa and they are famous for speaking a special clicking language. My friend Steven, who served his mission in Zimbabwe, can actually speak this clicking language. When Andrew and I are in South Africa we plan on learning more about the bush people and will probably even stay with them in their village. We also saw many Ostriches, birds, and wild cats during our drive. The landscape looks very different than that of Malawi or Zambia because the area is so dry and it was fun to be surrounded by such a different terrain. At the end of our excursion we drove home in the dark, which gave us a lot of time to spot the red eyes of bush babies in the dark and ask our guide all about Botswana culture. We learned that the most popular foods are seswa, sorghum, mealy pap, samp, biltong, and wild spinach. We also learned about wedding and funeral traditions in Botswana, and how the bushman live on a day to day basis. We were returned to Gweta Lodge in the evening we were well informed about everything relating to Botswana. AND to end the day with a bang, Andrew found my Chaco sandals in the reception area of the safari lodge. I was so happy I couldn’t stop smiling! Today was a GREAT day. One of the most challenging parts about being in Africa is balancing your life. I suppose that goes for any extended period of travel, but I’m especially feeling it today. Things that normally are consistent (scripture study, diet, exercise, etc) tend to be more challenging to make part of your daily routine, because your days are anything but routine. I’ve noticed this most clearly in balancing time with Kylie. Back home it was very easy to buy flowers, or plan a special outing together, but when you’re always together and on a very tight budget, making those moments spontaneous is a hurdle. Definitely a worthwhile hurdle, but a hurdle nonetheless. I think the travel and constantly being out of routine has been good in this regard, because it forces us to me more creative in the ways we make everyday outings special. While not a normal thought to share via a blog format, I felt this was a very important lesson on this trip and one that I wanted to share! This morning Kylie and I woke early, packed up our things, and boarded the bus to Gweta. It was sad to say goodbye to Cornelia after the few days we spent with her, but I know we’ll see her again. Cornelia really taught me about being Christlike in so many ways. Seeing her get out of her car to help an injured dog (when it very well could’ve bitten her), organizing meetings for the few saints in Maun, and taking in two dirty backpackers from the U.S., all were examples to me of Christlike service and love. As we boarded the bus we noticed a couple other backpackers who we quickly became friends with and chatted about their adventures. Meeting backpackers along the way is part of the fun of traveling. And I find that the people you meet along the way have such interesting stories and such interesting adventures to share. While a new world to me, it’s fun to get a crash course in exploring the globe from my wife. We arrived to Planet Baobab (our meerkat encounter group) in the morning and we dropped our things at their lodge. 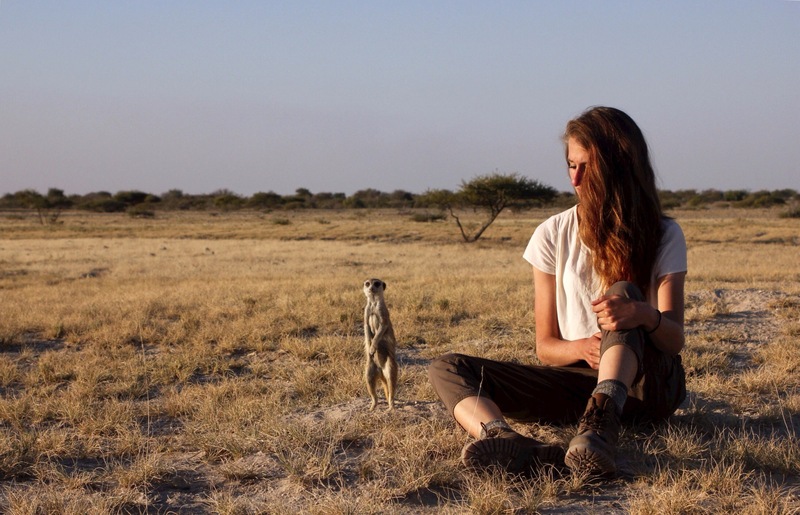 Kylie could hardly contain her excitement as meerkats is something she’s wanted to do our entire time in Africa. I’ve found Kylie loves animal excursions, so we were hoping that this one would be a memorable one for her. We arrived at Planet Baobab in the afternoon and sat down to get ourselves organized before our meerkat excursion. For some reason I was feeling a bit tired/down and that was worrying Kylie. That all changed as we started our drive out towards the pans to see the meerkats. I peeked up and got excited for our outing. We arrived in the afternoon after a 2 hour drive, and saw a cute, little family of 9 meerkats. 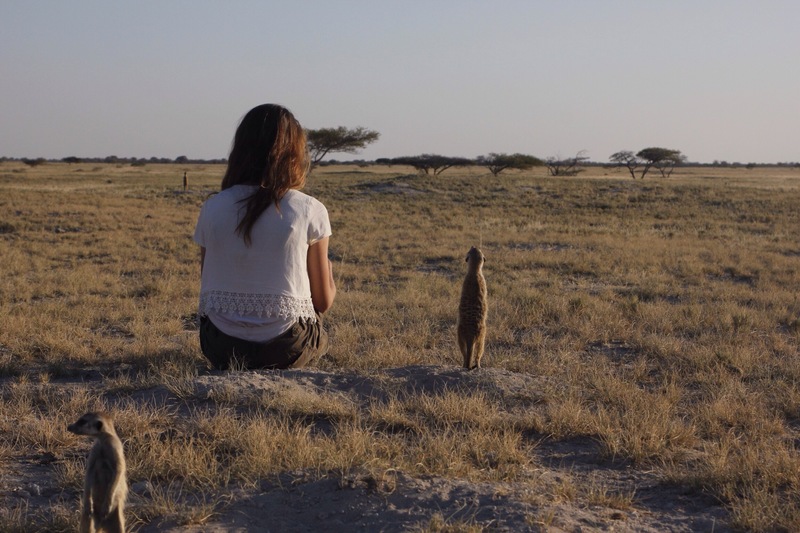 Before Kylie and I came to Africa she’d been researching what activities were in Botswana and she stumbled across this meerkat encounter photo. 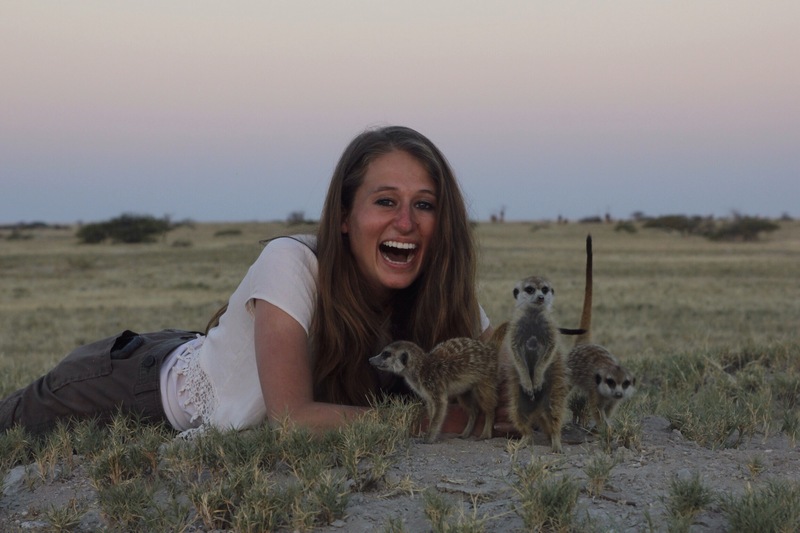 The photo had a girl lying down with 5 meerkats lined along her back! Ever since she saw that photo Kylie wanted to have meerkats stand on her. The funny thing is, wild animals still behave in unpredictable ways. For about an hour Kylie was ‘chasing’ these little meerkats around, sitting down next to them in the hopes they’d be curious enough to stand on her. They’d come close as if they were going to climb in her, but ultimately were just big teases. All the while I snapped photos to document the event. As we were more patient we had much better luck. We’d have Kylie sit down near the meerkats a few meters away and let them naturally run up to her. They stood next to her barking/chattering away. It was pretty cute. Eventually Kylie got what she wanted and a little meerkat jumped on her while she was lying down. Kylie was all smiles, and laughed the whole while. Seeing her happy makes me happy. The ride back we stopped in the pans to see ah enormous salt field. One of the largest in the world before setting off for Gweta lodge. The entire ride Kylie and I asked our guide a slew of questions, everything from how to prepare sadsa and meely-pap, to wedding traditions. When one one in Africa wants to get married you don’t talk with the parents at first. What happens is you send your uncle to go talk with the girls uncle, and then the uncles decide a dowry price (how many cows for the lady) and then the rest of the family gets involved. This serves as an accountability system too as if any marital issues arise (domestic abuse, bad cook, etc) then the family gets involved to help. If the couple gets married on their own (without the aid of their uncles), then if marital issues arise the couple is left to their own devices. It was very educational. We made good time and arrived at Gweta lodge just after 8pm. While Kylie prepared for bed, I decided to hunt for her sandals. A week ago on our way through Gweta Kylie had lost her chacos at Gweta lodge as we made a brief stopover. She was pretty upset as she was confined to boots for the entire Botswana leg, and they were an expensive purchase. We had both figured that anything lost in Africa would mean it was long gone. As I poked around the lodge…. I found them! That was an incredible blessing! I returned to our safari tent (cheapest accommodation at Gweta) and presented them to Kylie who was ecstatic. Great way to end an adventurous day. Tomorrow, off to Livingstone!